STOCKTON, Calif. — For the first two days of competition at the TroKar Duel in the Delta in Stockton, Ca., 93 Elite Series pros dealt with an ever-changing buffet of unsettled northern California weather. And as the 48 anglers who made the cut left Weber Point Park this morning for Day Three of the first Elite Series tournament of 2010, most of them were in a hurry to get to their prime water before the next significant meteorological factor came into play. The wind will be howling today on parts of the California Delta. Although it was clear, cold and still as the field blasted off at 6:30 a.m. PT, the National Weather Service is calling for sustained 10-mph winds out of the north/northwest by 11 a.m. rising to 18 to 21 mph by early afternoon, with gusts up to 30. With that forecast in mind, many of the big movers on Day Two are running immediately to their prime spots this morning to salvage as much of the best bite as they can. “The spot I’m fishing, if the wind blows 10 to 20, it’s toast,” said Delta veteran Gary Klein, who rode his primary location — a narrow, shallow canal that he describes as “a ditch” — to 21 pounds, 10 ounces on Thursday to jump from 19th to 4th. 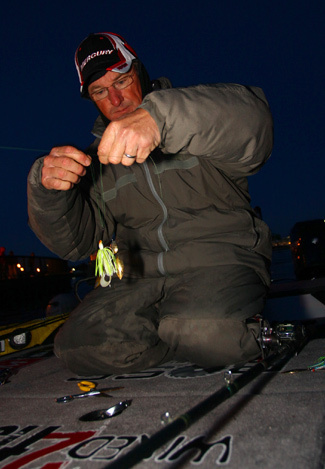 James Overstreet Gary Klein spends a moment tying on some baits on the morning of the TroKar Duel in the Delta. The way the bite has shaped up for many of the top 48 this week, the morning scramble might extend throughout the entire day. Even when the rain busted loose and the Delta’s bigger largemouth started to bite on Thursday, many of the field described the bite as a day-long grind, broken up by short flurries on the late-morning tide change. 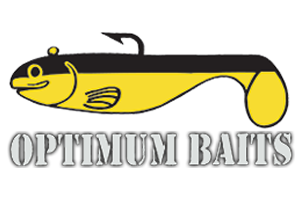 How the wind affects that day-long bite will be dependent upon the lay of the land in the areas the anglers are fishing. Day Two leader Stephen Browning, who has diligently worked a series of spots in the north Delta for two straight days, appears to be set up perfectly to handle a north/northwest wind because the main slough he’s fishing runs east/west and is somewhat protected by a levee. Browning, who pulled a Day Two switch to a smaller bait that resulted in a 23-9 bag, plans to continue to ride that area as long as he can. A ¼-ounce red- or orange-craw Speed Trap seems to be a popular bait, too, as James Niggemeyer rifled through Dean Rojas’ tackle tray for a couple of the shallow-medium cranks. Day Three, tournament strategy now starts to come into play. 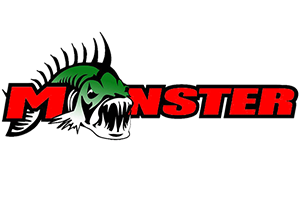 While everybody was just concerned about making the cut on the first two days of competition, now the remaining 48 anglers begin to run “what if?” scenarios through their heads. Even though Thursday’s weigh-in was jolted by some big-fish electricity, at least one angler, northern California native Ish Monroe, thinks the Delta is still fishing slower than normal for early March.